Today, I am keen to write in length after hearing direct press conference of HE Yim Sovann on four outstanding summaries he articulated thoughtfully within those 16 minutes. First, the important framework of “party policy manifesto”; secondly, tasks within parliamentary meeting session on national budget drafting; thirdly, the slow investigation of authority on the murder of Dr. Kem Ley which has prevailed intractable impunity; fourth, CNRP’s heads of commissions shall summon at least three ministers namely Minister of Interior HE Sar Kheng, Minister of Agriculture HE Veng Sakhon, and Minister of Mines and Energy HE Suy Sem to come to the Assembly. 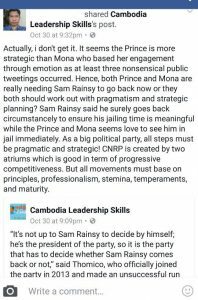 Since the coalition was made, I ever predicted the difficult tasks to undertake key policies of the party aiming to take high responsibility as the biggest opposition party in Cambodia. The marrying between SRP and HRP has not been easy to mobilize force although each party placed the same goal for nation-building. From top to bottom, there are differences in political approaches, integrity, experiences, maturity, and workmanship. Many MPs from HRP pole took severe confrontational approach aiming to overcome the power of Hun Sen. HE Kem Sokha is observed by his uncertainty in fulfilling his key task as first vice president of the national Assembly, and he was likely pushed to compete for political popularity with his President, HE Sam Rainsy. 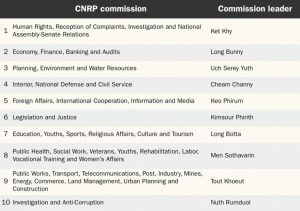 Many amended laws to allowing some level-playing field for CNRP have been stagnant. Furthering to the dismissal of HE Kem Sokha from 1st Vice President of the Assembly, the creation of minority leader of the assembly with his cabinet, office, and budget, is not yet materialized. The aims of going back to the Assembly of all 55 law-makers of CNRP were full of hope to bring changes of all fields particularly the effective Assembly. But with an attempt to weaken this force by Prime Minister Hun Sen including the less experience of CNRP law-makers, the Assembly has been seen inactive during these two years. There are several mechanisms that 55 law-makers of CNRP can influence Assembly as well as the government leadership such as undertaking chapter 98 (new) of Constitution properly, 7 heads of commissioner in the Assembly from CNRP could pay much attention to produce policies for constructive criticism towards the government as well as to prepare itself to be the government, 1st Vice President of the Assembly, legal recognition of loyal opposition party, and the creation of Minority Leader in the Assembly etc. Crafting core policy or being called “policy manifesto” is essential to drive both soft and hard skills towards goal-setting. An effective policy, according to policy theorists, has always focused on: robustness, efficiency, costs effective, political acceptability, and administrative feasibility etc. Many policy analysis has taken SWOT or Strengths, Weakness, Opportunities, and Threats, as their core value to judge a policy is effective or not effective. 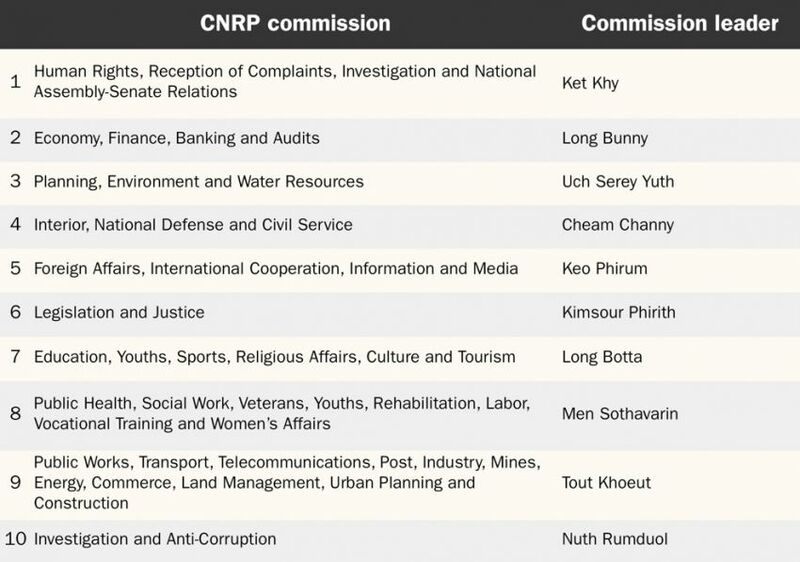 Recently, the Permanent Committee (PC) of CNRP decided to establish shadow leadership for effective criticism by appointing HE Son Chhay as leader and appointing other key commission leaders for 10 different commissions(picture attached here) to ensure effective criticism are materialized. Thus, those 10 leaders seem busy with meeting local supporters more than penning policy framework, writing proposals, and implementing it according to duties and status of these new commissioning. As many people requested, now it is time for the two parties leaders ie. HE Sam Rainsy and HE Kem Sokha relinquish the competition by not positioning themselves as SRP and HRP any more. Now, they both are part of CNRP which has framed its smooth hierarchy and political bureaucracy on whom is President and whom is Vice President. The scores of latest public denouncement by some of the party’s prestigious member(s) towards their top leader(s) is not fun at all. All internal criticism according to democracy must be happened within its core framework of constructiveness and majorly within its circle executive members. Today, the “policy manifesto” is laid out and it must be properly implemented; tomorrow, the internal by-laws or party’s statute must be put in place. Those policy, platforms, or by-laws, must not just simply printed and handed over to members, the coaching team must work effectively to educate all members about them. Some time, opportunity is a rare! It happens only one time and never come back again, who know? Thus, the voice of the people to support CNRP in 2013 is huge and sufficient enough to drive changes in Cambodia. Struggles several decades with improving gradual achievements are a good sign indeed, but this doesn’t translate that the longer time opposition party will take to overcome its government-led party shall not be labelled as a rubber-stamp to the government-led party. Bonding together to avoid dividing is one virtue, and working hard through using all mechanisms intelligently is another, but to maintain its status-quo forever opposition party is not good for both leaders and supporters in a long run. This is called the worse side of regression. CNRP cannot loss it struggles. CNRP cannot loss its sight in manipulating crisis into success at all. As the top leader has gained enough trust from the people, the common sense informs him to focus on structural building for government leadership more important than anything else right now.